A four-day trial resulted in a finding that an amendment to a trust, disinheriting my client, was the result of undue influence. The trust amendment was invalidated and this restored the effect of the former trust; the disinherited long-term friends (the de facto family of the decedent) were restored as the 100% beneficiaries of the estate. Probate litigation is decided by the Judge, not by a jury. Nevertheless, visual presentation is effective to either a Judge or to a jury. Trial presentation software gives an advantage to the lawyers who use it to make points both orally and visually. Instead of merely talking about a fact, it is far better to say, “Look at this”. Most trials are done without sufficient images. We used trial presentation software to show both the logic, and to show the emotional history between the client and the decedent. Near the beginning of opening statement, a document exhibit was projected on the screen. Then the relevant words were zoomed in on, using the software. As a practical matter, in 30 seconds this disposed of an issue the other side was relying on. Our side displayed lots of photos and letters and holiday cards from over the years, proving the nature of the long-term relationship with our client. We displayed time charts to show the sequence of events, to highlight the circumstantial evidence of undue influence. As experienced trial lawyers know, closing is generally insignificant, because the finder of fact has usually decided the case by then. Nevertheless, two images put up during closing argument made our side’s case very clear. The first image was side-by-side photos to show a contrast in the decedent’s appearance. The second was a time chart, with an un-shortened time axis, to show the sequence of events near death. These images were intended to clarify what could have been a jumble of facts. During closing, the Judge asked a question about the sequence of events near death. It was easy to walk over to the time chart to point out that the start of the period of undue influence was before the sequence of events leading to the change in beneficiaries. 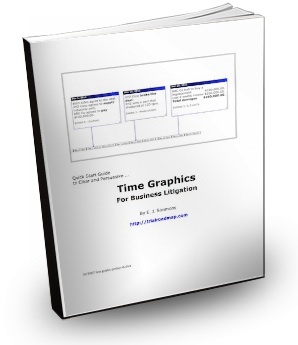 I make available for sale a brief report for lawyers about how to use time charts in trial. To invalidate a will or a trust because of undue influence requires a confidential relationship, and one or more “suspicious circumstances”. In a confidential relationship, one person trusts the other to act in her best interests, and relies on the other to meet her needs. Once a confidential relationship is established, “slight evidence is sufficient to establish undue influence.” In re Reddaway’s Estate, 214 OR 410, 420 (1958). Add one or more suspicious circumstances, and an inference of undue influence arises that the respondent must rebut. The burden shifts for a reason: because undue influence occurs behind closed doors, out of sight. Unexplained change in donor’s attitude. Change in plan for disposition of estate. The clarity of visual presentation makes circumstantial evidence more persuasive. 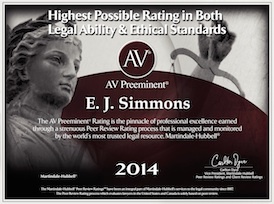 If you have a will contest or trust contest to discuss, you are invited to call E. J. Simmons at (503) 221-2000. When you have a trial or arbitration coming up, whether to the Court, to a jury trial or to an arbitration panel, the decision makers are not familiar with all the facts in the case. So your opening statement must be clear and easy to understand. I have a new site that offers a concise report on how to get a time graphic ready for litigation. The Trial Roadmap site is about presentation in business litigation or other litigation with complicated facts. Your presentation can be both effective and efficient to prepare. To get your most important graphic ready for opening statement, the report and access to the how-to video is available now. Click over to TrialRoadmap.com. This site now offers a fast and free search engine, to find relevant Oregon cases from the last ten years. Included are Oregon cases about civil law, criminal law, negligence, contracts and all the other issues that were appealed. The search results link to the slip opinions of the Oregon Supreme Court and Oregon Court of Appeals. You can get much of what you need in 10 minutes using this feature. Just put the relevant words into the search box, and click on the Go! button. If you get more than 50 results, add more words to the search box to narrow down the results. You may see that you need to put in a negative term to eliminate irrelevant results that tend to include your search words. Then, print the first results page. The first page of results will have the top 10 cases, put at the top by the statistical ranking calculated by the search program. With the print out in hand, start clicking on the results, top to bottom. If a case is irrelevant, cross it off and go to the second, etc. In a few minutes you will have close to a finished understanding of the relevant law. This search facility is fast. I suspect it is much faster than the competition. In fairness to the competition, the database is only 10 years of case law. You are invited to run a speed test comparison and let me know what your experiment reveals. The site works reasonably well if you use an iPhone or a T-Mobile G1 phone, given the limitation of using the small screen on such a smart phone. Making a search from your smart phone may be of use if you need a quick look while you are out of the office, perhaps while waiting in the courthouse and you just spotted another issue. Your comments are invited, and will help improve the search facility.